Set back in a time of peaceful splendor is a charming 4 bedroom cottage of yester-years. Nestled near the quaint town of Eddyville. This wonderful home sits in a perfect spot over looking the sparkling blue main channel waters of Lake Barkley. The home has many extra's a large yard for play, a screen porch and a beautiful covered wrap around porch. Also steps that lead down to a great fishing and swimming area. Inside you will feel cozy and comfortable in this newly decorated home with updated appliances. This is a great place to relax but also have some great fun. The location is convenient to many recreational ventures such as golf, marina's, water park, restaurants, and shopping. The view of the lake is truly spectacular with colorful sunsets and rolling waters. It isn't unusual to sit back on a beautiful day and see a Blue Heron, Pelicans, and even a Bald Eagle. This oasis is the perfect getaway for 1-4 couples or 2 small families. The view had us sold!!! It is one of the best you will ever see on the Lake. I guess that is why Matthew Lyon who founded Eddyville and Lyon County had once owned this lot ! It is truly a beauty! Our house has all the modern ammenities but yet so much history. Come stay and see for yourself. We would loved to have you! This property is close to Grocery Store, Liquor Store, Gas Stations, Restaurants, Marinas plus Golf course and Waterpark. You won't have to go far if you forgot something or if you are wanting to get to some great recreation in!!! Our location is not only convenient it has good paved roads that makes it easy to get you back to the highway. Awesome main channel view with lake side breezes and majestic sunsets. Steps leading down to a great fishing area. We loved the character of the old home. Would love to know more house history...year built, family home? 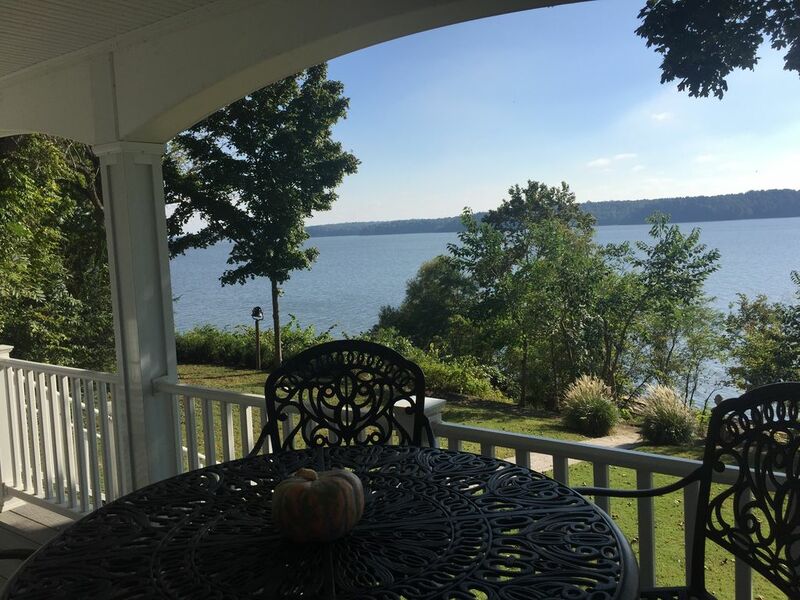 Loved having morning coffee on the beautiful wrap around porch looking over the lake. Our 6 kids, even teens, spent do much time on the beach searching for treasures. We were amazed at the Land Between the Lakes, especially the buffalo! So fun! We have rented this house for the past 5 years. It has always been clean and ready for our stay. Enjoy this property and would recommend to anyone looking for a lake house get away!! Thank you Jeff! Always a pleasure hosting you in our Lake home! You guys a great group. Thanks again we appreciate it! Some good some bad.Disapppointed with getting to lake front. Need to trim trees for better view. We are sorry that you were disappointed about the trees. Our tree trimmer was in a very serious accident. We have been unable to find someone to trim until Oct. 10th. The core of engineers takes care of the lake shore area. We can’t touch that area. Nice and roomy house right on the lake. We had plenty of room inside and out. Really enjoyed the wrap around porch with rain coming down all weekend long. We did manage to start a fire in the huge fire pit and walk along the shore line. Saw deer galore roaming through out the area. Home is close to some nice restaurants and a grocery stre as well.If it hadn’t rained it would’ve been a perfect place to stay. Recommend anyone who wants quiet time come here! Water heater went out while we were there and the owners had someone replacing the water heater even though it was a holiday weekend which was much appreciated by all of us since it was in the 90’s. The fire pit had stones to sit on around it which was nice but there still was enough room for the lawn chairs we brought and plenty for firewood. The air conditioner worked wonderfully. The porch had ceiling fans, rocking chairs, bar height table and chairs and citronella candles. The view from the porch was a little obstructed by the trees but we could still catch glimpses of the barges and the boats as they went by. We spent the bulk of our time on the porch and at the fire pit. Great breeze off the water as we were up on the bluff and the breeze kept the skeeters away too but the owners had off available. The steps down to the water were a little steeper than what they looked like in the picture and everyone but my sister who had a hip replacement, were able to get down to the water. There was plenty of large rocks to stand on and fish and watch the sunset. The ground the house sits on is rolling and has steps down to the house from the parking area so I would caution anyone with balance issues. The House was a short drive to a grocery store, gas station(also had bait),hardware store and liquor store. Our party only left the house twice over the weekend and that was to eat at the CATFISH KITCHEN(very good can make reservations) and to go to the BISON/ELK PRAIRIE(go early opens at dawn we were there by 9,very neat) and then to the HOMEPLACE (farm from 1850). The history of the House was really neat also. Everyone (3 couples 30’s,50’s and 60’s) has a very relaxing and enjoyable time. Thank you for sharing your home with us. Thank you Marsha for the review. So unfortunate that the hot water heater went out of course on a holiday weekend. sure glad we did get the guy out there with a new one. It took a lot of calls but thank goodness it all worked out. Thank you so much for your patience! Nice clean with beautiful view. Thank you so much for the review Michael. Glad you enjoyed your getaway. We hope you will come back again. Venture River Water Park-7 mins. Mineral Mound Golf Course-5 mins. Kentucky Dam Village Golf Course-15 mins. Land Between the Lakes-15 mins. Lake Barkley State Park and Golf Course-20 mins. Paducah Shopping and Restaurants-30 mins. Eddy Creek Marina (Boat Rentals & Restaurant)-7 mins. Buzzard Rock Marina (Boat Rentals, Rest./Bar)-10 mins. Kuttawa Marina (Boat Rentals, Rest. )-7 mins. Green Turtle Bay Marina(Boat Rentals, Rest. )-15 mins.